The following is an excerpt from a special report by Printing Industries of America. It was designed to help members assess the key trends impacting the economy and print markets over the next 1224 months and to design strategies and tactics to take advantage of coming opportunities and address potential challenges. The report provides an environmental scan of recent economic and print market trends, plus the PIA outlook for 20132014. The market space for printers has been changing dramatically for decades. 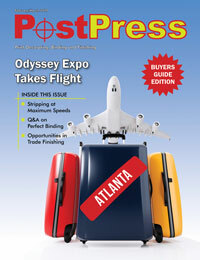 While print-on-paper remains the keystone of the industry, printers are increasingly becoming communications service providers and moving into integrated media. This expansion of the print market space has created a new print plus business environment with expanded opportunities and challenges. At the macro level, prints economic footprint is massive, diverse and laden with opportunity for entrepreneurship, growth and profitability. At the same time, there are significant challenges from a very competitive environment  both among printers and between print and other media. Our definition of the industry includes printing and related support activates (Economic Censes code 323), plus print-related media (Economic Census code 511). Print-related media includes newspapers, periodicals, books, directories/mailing lists and greeting cards and includes only activity directly related to print. Prints US economic footprint in 2011 totaled over $158 billion in annual shipments. The industry had almost 48,000 establishments employing just fewer than one million employees and hiring approximately 50,000 new employees per year. The printing industry also is Americas most geographically dispersed manufacturing industry with a significant presence in all fifty states. Further, it is diverse in terms of size of firms with small, medium and large businesses represented. Looking back at the last two years, Commercial Printing and Related Support Activities (NAICS 323) shipments have inched up just slightly (0.4 percent in 2011), while Print Related Media (NAICS 511) shipments have declined (4.9 percent in 2011). Establishments and employment have declined for both categories. Employment per establishment has increased for printing, declined for print media and remained stable for total print. Throughout the course of 2012, print markets were boosted by hundreds of millions of dollars of direct mail promotion associated with the national election. However, print markets also were held back by the slow economy and the intense competition of digital media. Magazines and newspapers in particular are feeling the impact. For the first time ever, marketers spent more on digital advertising than print advertising in 2012. For example, Newsweek decided to become an all-digital publication. Looking out over the next eight quarters (from the first quarter of 2013 through the fourth quarter of 2014), it looks like a pattern of 2.02.5 percent growth in inflation-adjusted economic gross domestic product will prevail. On the downside, we assume a continuation of only a minimum patchwork of cooperation between Congress and the President in addressing both short-run and longer-run tax, spending and deficit issues. On the bright side, the increasing energy production should keep energy prices in check and help with global competitiveness. Of course, the elephant in the room is the out-of-control federal budget  especially mandatory entitlements like Medicare, Social Security and Medicaid and their negative effects on the economy and fiscal deficits in the long-run outlook. Over the next two years, Printing Industries of Americas forecast calls for a continuation of the slow economic growth that we have experienced over the past year  around two percent adjusted for inflation. Commercial Print & Related Support Activities (NAICS 323), which we track and forecast on a nominal or non-inflation-adjusted basis, likely will remain stable in 2013 and grow slightly in 2014 as the economy improves. While the slow economic growth is not sufficient to pull print up by much, the good news is that the recovery has matured (although at a snails pace). Print Related Media (NAICS 511) will continue to decline in 2013 and 2014, but less than the trend rate of 4.0 percent. In 2013 and 2014, we expect this sector of the industry to decline by about 2.0 percent each year. The reason for the slower decline is that we are in the sweet spot of the mature recovery for print. Although growth has been slow, this recovery has been consistent for the past two years and this is when it starts to positively affect industry shipments. Overall for the next two years, as can be seen in the graph above, Commercial Print & Related Support Activities and Print Related Media shipments will decline by less than one percent in 2013 and remain relatively flat in 2014. For 2013, print logistics (packaging and labels/wrappers) should lead the way and grow at a pace resembling the overall economy (two percent). Spending on marketing print (direct mail, catalogs and ancillary marketing materials) will suffer from the end of the election year and remain flat for the year. Expenditures on inform and communication print will likely fall around two percent. Prints overall life cycle has moved from growth to mature to possibly a declining position. However, a truer picture emerges when life cycles are examined by process, product and function. While some process, product and functions of print are mature or declining, many remain in the growth phase. While all print sectors could be characterized as competitive, some sectors score significantly higher or lower in competitive intensity. On both a life cycle and competitive intensity measure, there still is plenty of opportunity left in the printing industry. Even in mature and declining sectors, there are management strategies and techniques for firms to improve their performance and do very well for a long period of time. Dr. Ronnie H. Davis, vice president and chief economist, and Ed Gleeson, manager, economic and market research, serve in the Printing Industries of America Economic and Market Research Department. This excerpt presents a portion PIAs annual review of the economy and print markets during the past year, plus PIAs economic and print market outlook for the next twelve to twenty-four months. Additionally, an assessment of longer-term competitive issues for printers is offered. The objective of this report is to serve as a resource to plan the year ahead for your firm. To purchase the full report, contact PIA at 412.259.1770 or visit www.printing.org/store.